Israeli warplanes attacked a military research center in Damascus province at dawn on Wednesday, Syria's military command said, denying reports that the planes had struck a convoy carrying weapons from Syria to Lebanon. Local residents and experts claim the target was a chemical weapons production center. Two people were killed and five wounded in the attack on the site in Jamraya, which Syria described as one of a number of "scientific research centers aimed at raising the level of resistance and self-defense". The building was destroyed, the military command said in a statement carried by state media. It said the planes crossed into Syria below the radar level, just north of Mount Hermon, and returned the same way. The Jamraya area contains many military facilities as well as what is likely a chemical weapons production and storage site. The area also houses training camps for Hezbollah combatants who are learning to operate advanced Russian weapons systems. It was further noted that the attack occurred after terrorist groups tried and failed to take control of the site several times. The Syrian army statement denied that the strike had targeted a convoy headed from Syria to Lebanon, instead portraying the strike as linked to the civil war pitting Bashar Assad's forces against rebels seeking to push him from power. Residents near Damascus had previously told AFP that missiles had struck a military site for unconventional weapons on Tuesday at 11:30 pm. According to them, the center, which is located in Al-Hameh, about fifteen kilometers north-west of Damascus, was hit by six missiles that were partially destroyed, causing a fire and killing at least two people. A Lebanese news website quoted a Syrian source as saying that the target of the alleged Israeli strike was a chemical weapons center. 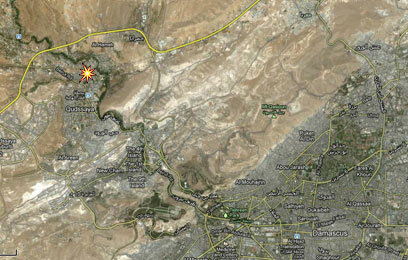 The Damascus source said that the attack took place at 1:30 am at a scientific research center in the Jamraya area. He added that four security guards were killed in the attack and that the blast could be heard as far as Damascus. Syrian rebels posted a video allegedly documenting a series of blasts at the center shortly after the attack had taken place. The video could not be authenticated. On Wednesday, several rebel leaders claimed that they had attacked the site with mortar shells. Israel's intelligence community has been aware of the military research center for decades. Some of the center's studies have been presented as civilian in nature. Yiftah Shafir of the Jaffee Center for Strategic Studies at Tel Aviv said, "It is a secret governmental body that answers directly to Assad and aggregates all of Syria's military research institutes." Earlier on Wednesday AP quoted US and regional officials as saying that Israel conducted an airstrike inside Lebanon, hitting a convoy of trucks. The officials said Israel had been planning in the days leading up to the airstrike to hit a shipment of weapons bound for Hezbollah in Lebanon. 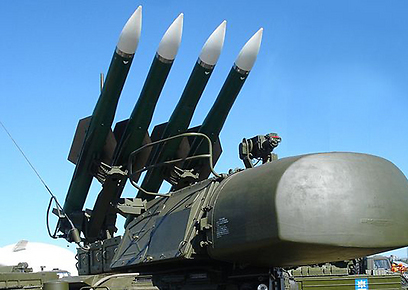 They said the shipment included sophisticated, Russian-made SA-17 anti-aircraft missiles, which would be strategically "game-changing" in the hands of Hezbollah. Lebanese sources also commented on the reports and stressed that there had been no strike inside Lebanese territory. An eye witness from a border town said that there had been no explosion. A senior official with the Lebanese security forces told Turkey's Anatolia news agency that they were not aware of any attack on the Syria-Lebanon border area. He did however say that an Israeli force had infiltrated the border strip in south Lebanon for several minutes on Tuesday night. Lebanese army sources said that the forces did not observe any Israeli activity overnight. See all talkbacks "Syria: Israel attacked military research center"